Happy Friday, it's one of my days for being at home today. Yay. I have been snatching the odd hour or two over the past few days and made a tag which has been inspired by a few challenges. 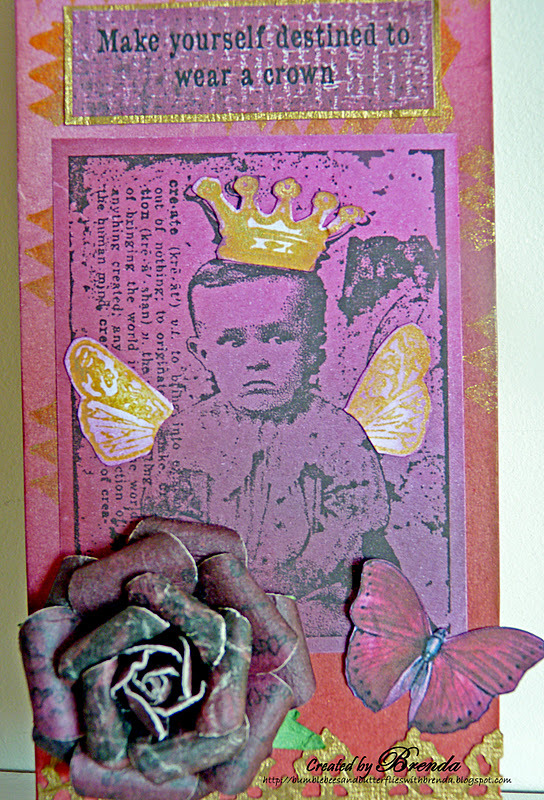 Firstly Simon Says Stamp and Show - Kings and Queens, this little one is definitely 'in waiting'. Secondly Crafter's Cafe have this amazing colour challenge - red, purple and pink and I added some gold to enhance the royal look. Charisma Cardz want Vintage. 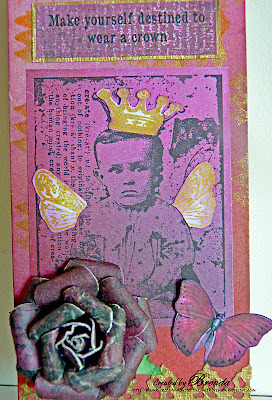 I used PPs to create the background, blending the red, pink and purple together and stamped over with gold stazon. The image was also blended with the PPs and stamped in black archival ink using a TH stamp. The crown and wings were also stamped with gold stazon. The flower is prima and a downloaded butterfly. The message I found as part of a longer sentence on the internet and printed it using PSE and a digi backing paper. I shall be back on Sunday with a new PanPastel UK DT piece. Interesting project. Beautiful choice of colours. It's very successful ! Bravo ! Thanks for the song words Brenda but who was it !!!! 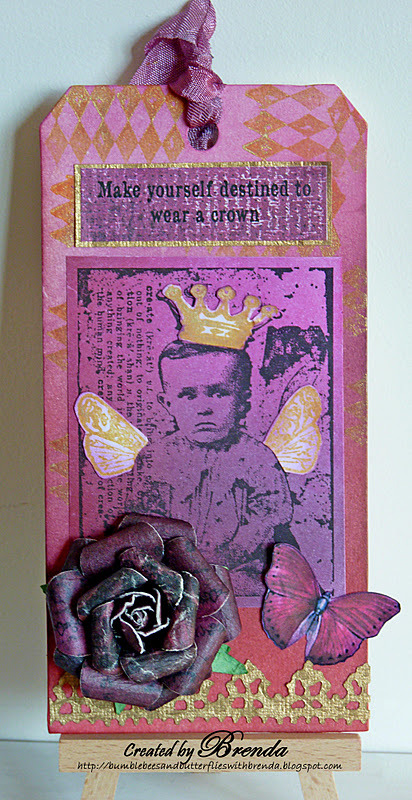 Love this fabulous tag your colour combo is stunning they work so well together , the kid looks a bit miffed though lol ! I adore the flower simply sensational but then again you are the fabulous Brenda so I shouldn't be surprised. thank you for your lovely words and have a fab weekend. That little chap always looks so grumpy! The intense purple works so well for the crown theme and I find the textures and patterns so interesting. Your tag is great. Love the colors. And the flower, oh, the flower!! I love how you stamped and decorated that not so happy baby. So cute and funny! And yes the Prima flower is gorgeous. Wonderful project Brenda. Your rose is gorgeous. Thank goodness it is the weekend! Hope you are well and warm!! Oh what a completely gorgeous tag and I adore that flower!!! Beutifl,Brenda, and a great sentiment. You lucky girl, I wish I got to stay home today! This is incredible, dear Brenda! I love everything about it. Love the regal colours, its a great tag, and image. The little prince looks cute with his wings and crown. This is gorgeous!! The flower is incredible!! Thanks for playing with us at The Crafters Cafe Challenge blog!! Brenda, the touches of gold certainly do add a nice royal touch! Love the little crown and wings, so fitting for a King or Queen! The flower is so elegant and again the gold really pops! Have a great weekend! Hugs! Wow! What a unique and beautiful style! Your have blended the image, inks and embellishments together in such a lovely way. Wonderful work! So glad you posted your card at the Crafter's Cafe Challenge Blog! Awesome tag and one of my very favorite stamps. He makes a darling king! Nice tag and good balance using your chosen colors! This is totally ACE Brenda that image made me smile the rest of the wonderful design just grabbed my attention I try to soak up as much as i can then hopefully my brain will one day be able to feel it can try something like this, lol, I have to take my time. Fabulous tag!! Love your flower too. Thanks for joining us at The Crafter's Cafe Challenge Blog for our color challenge. A fab vintage tag, thanks for joining us at Charisma Cardz this week! A fantastic tag in great colors. Love the flower. Beautiful use of the challenge colors for your tag! Thanks for playing at The Crafter's Cafe Challenge Blog. Hehe I love the little fella's facial expression! He does not look happy but it's cute at the same time! Thanks for joining us at Charisma Cardz this week! Simply gorgeous tag. The flower is the prefect touch. Thanks for joining us this month at CCCB, and hope to see you back next month for another challenge. Linda, you did a fab job with these colors and we appreciate you coming over to the Crafter's Cafe and playing with us! I love working with Pan Pastels as well and the harlequin stamp you used on your tag for the background is perfect with the rest of your card. Great job!